I’m writing you today to tell you that you were simply the best soup that I’ve had all year. Yes, we all know that I am embroiled in a tumultuous life-long love affair with my Classic Beef & Tomato Macaroni Soup, but I can only stir a pot of that so many times before my significant other gets bored with it. Just when I thought that I would never love another soup again, you came into my life and I am a happier woman for it. You’re meaty. You’re cheesy. You’re so hot, yet comforting and always there when I need you. Your starchy, decadent white carbs satiate the winter beast within me and the protein keeps me going all night long. 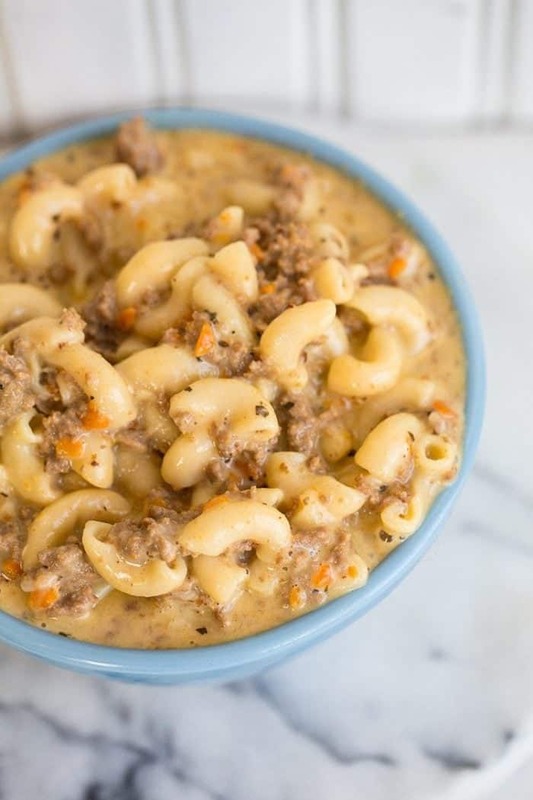 Fifty Shades of Crock pot Macaroni Cheeseburger Soup, anyone? You guys, let’s get serious now. No, really. I rarely drop the D bomb ( or any other for that matter) on this website, but this soup was worthy of it. I have always had cheeseburger soup on my list to try but I’ve never committed. 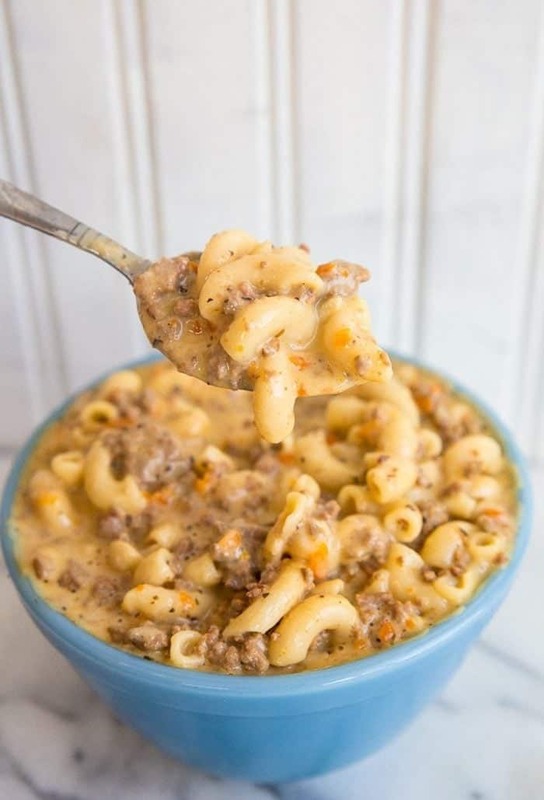 Then I thought to myself, hey self, why don’t you make that cheeseburger soup that you’ve been wanting…and why not throw some macaroni noodles in it? My family almost fought like wolves over the leftovers. My daughter ate an entire bowl without complaint then asked for more. My son was devastated that my husband and I had eaten the rest for lunch the next day. You could chock that up to the normal teenager hormones but that isn’t the case here. 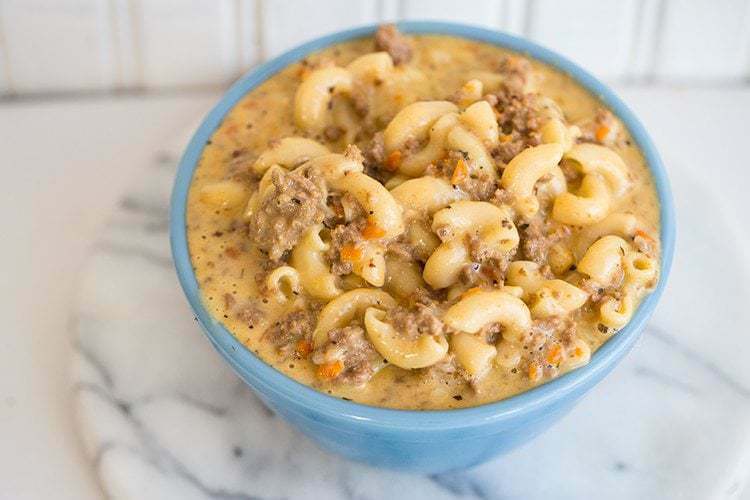 Let me assure you that this Crock pot Macaroni Cheeseburger Soup is worth fighting over. Worth getting devastated over when your parents eat it for lunch the next day and don’t leave you any. Worth filing for divorce when your husband eats the last damn bowl on you. Ouch. There’s that D word dropping again. Ground beef is very good in soup and you can lower the fat by cooking it completely and then rinsing it in a colander with hot water. Rinse all that grease off and you save tons of calories and fat. Which you then make up for with the Velveeta, but whatevs. If you are using it in another leaner recipe, this is a great trick! I like to cook my noodles IN the soup to add the starch to this dish, but if you don’t like that, cook the pasta and add it in at the end to heat it up in the soup. 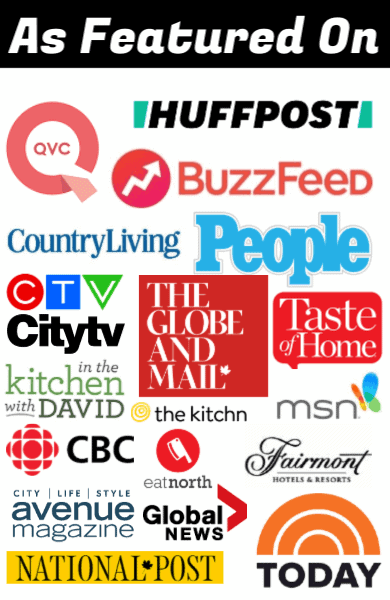 What I’m trying to tell you guys here is that everything I post here on The Kitchen Magpie is a great recipe. Good doesn’t cut it; it has to be great, Worthy of you. 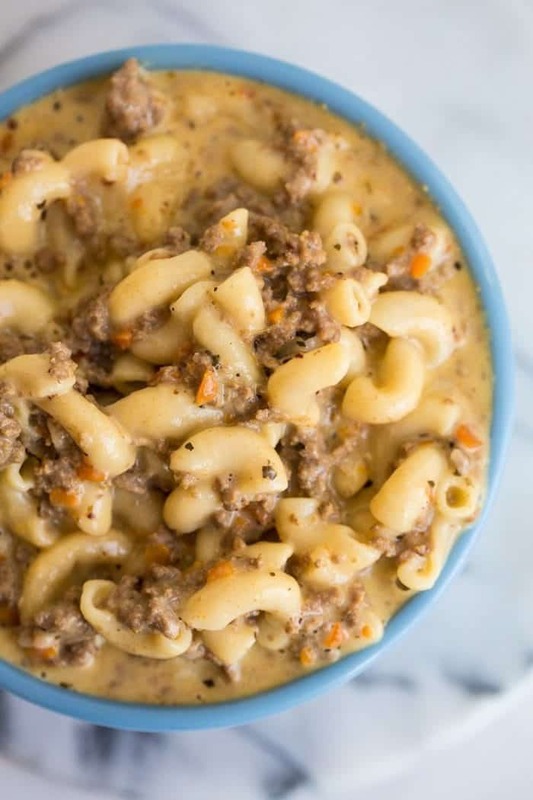 This recipe for Crock pot Macaroni Cheeseburger Soup?? Fantastic. Superb. 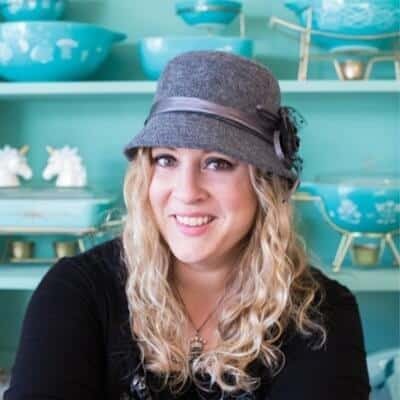 I should have kept it for my next cookbook – and you might just see in there anyways – but I wanted you to be able to eat it all winter long because I love you. It’s cookbook worthy, but I had to get it to you. I would be a terrible online friend if I didn’t. Eat this soup. All winter long. If you don’t eat red meat, make it with ground turkey because it will also rock your freaking socks. Don’t substitute the Velveeta cheese. You NEED that cheese. Trust Magpie. I rarely lead you astray. Let me know in the comments below if you’ve made it! PIN this recipe to your SOUPS board and remember to FOLLOW ME ON PINTEREST! Fry up the ground beef in a large skillet until mostly browned. Add in the white onions and fry until translucent and soft. Add the garlic and fry for a minute or two and by this time the ground beef will be fully browned. Place in the bottom of a large crockpot. Pour the chicken stock over the beef mixture and add the carrots and basil. Half and hour before serving, add in the macaroni. Cook until soft. Alternatively, you can add in cooked macaroni after the next step. Whisk in the milk and Velveeta. Stir until the cheese is melted throughout the soup completely. This recipe sounds so much like a soup my father used to make. It was so delicious and he would always make a huge batch and it was a true labour of love and he was so proud. Such a nice memory! The perfect winter soup. I do believe that our bodies require this amazing soup, often every winter. Absolutely delicious but this made WAY to much for two people. Hopefully it freezes well. If I make this again, I think I’ll skip the carrots (don’t really like them & don’t see that it adds much flavor). After reading a few comments about lack of taste, I added a can of mild rotel tomatoes & end product was Sooooo good! this is seriously the best thing i have ever eaten! it’s so good, and hearty and warming. added some shredded sharp cheddar and it’s phenomenal! will definitely become a staple. thank you so much for sharing!